Like most people with full lives, cooking doesn’t always make it to the top of my priority list. There are plenty of days when the question “what’s for dinner?” gets answered by ordering in or going out or boiling some noodles and dousing them with peanut sauce. And while it doesn’t quite match the picture I have in my head of the perfect, responsible-adult-vegetable-laden-home-cooked meal, it’s not so bad. Especially when it ends with one of these blackberry milkshakes. They’re so simple. And so good. And just the thing, really, for a lazy dessert. The blackberries from Mick Klug Farm have been extra special this year. They’re all sweetness and bright acidity, each tiny drupelet on the verge of bursting with deep purple juice. I’ve been bringing them home from the market by the pint-full. But fruit plus ice cream? Now you’re talking. 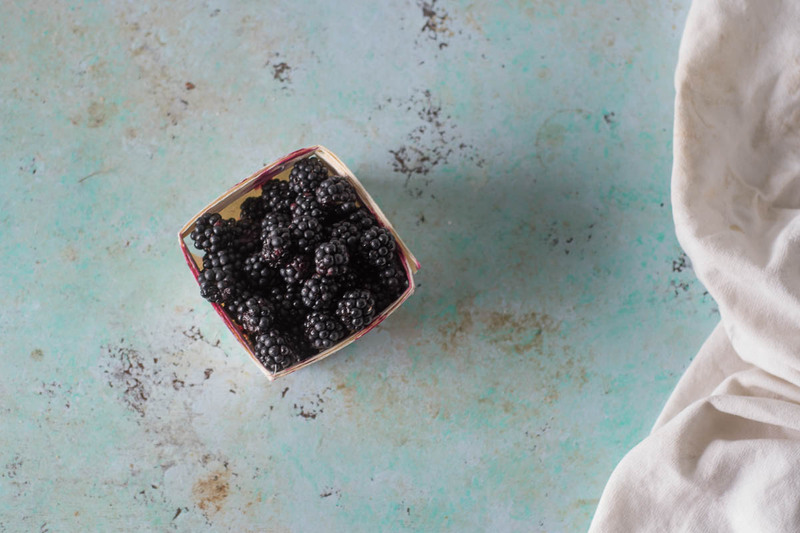 These blackberry milkshakes are so simple that I hesitate to call it a recipe. It’s just a simple zizzing of berries into a puree in a blender, adding vanilla ice cream, and zizzing again until blended. These milkshakes push the limits in the blackberry department. They’re shot through with fruit and have a lovely acidity to balance out the richness of the ice cream. 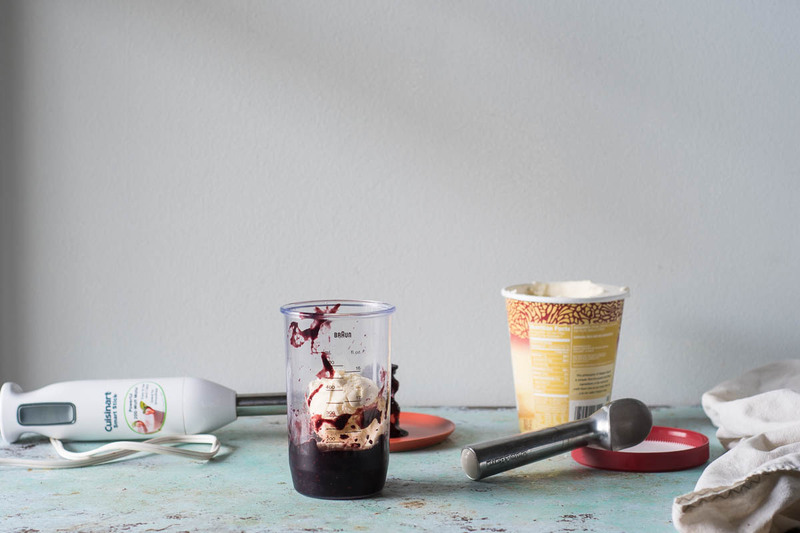 The fruit puree is the only liquid in the milkshake–there’s no milk or anything else to help loosen up the ice cream into a straw-friendly format. It turns them a bold, saturated purple color, and I love that about them. Honestly, they might be my favorite lazy dessert ever. 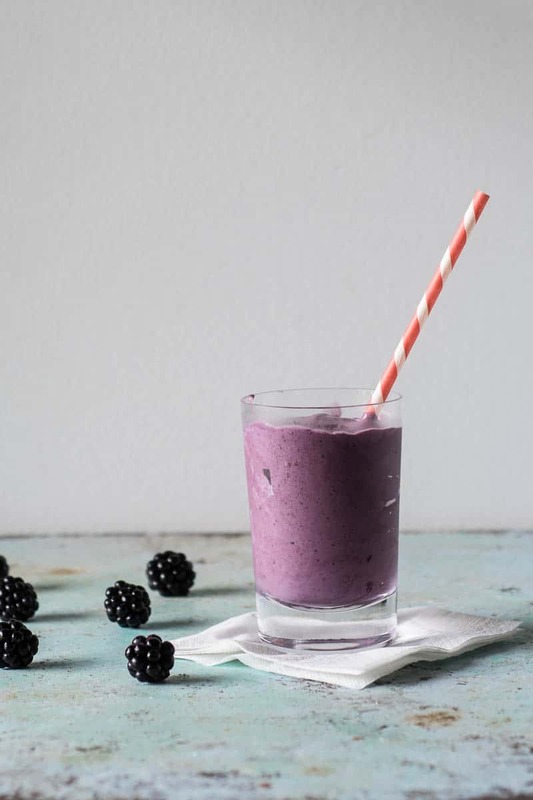 These two-ingredient blackberry milkshakes are incredibly easy to make. They're also incredibly flexible. You could easily make them with strawberries, raspberries, blueberries or cherries if you wanted. You don't need a fancy blender. You can make it in a Vitamix if you have one, but a stick blender will totally get the job done. Of course using the best berries you can find will make this better, but the vanilla ice cream will smooth out any minor imperfections in the berries. Use any vanilla ice cream you like. I tend to look for varieties that feature pronounceable ingredients, but the brand our style is entirely up to you. Puree the blackberries in a blender until they form a liquid. Add the vanilla ice cream and blend until smooth. Divide into glasses and serve. That is my kind of dessert. I love fresh fruit especially if locally grown. These milkshakes are perfect for the hot days of summer. Looks delish! Thanks! I’m a big fan of local produce too! I always make banana milkshakes with ice cream in the summer but somehow the thought has never occurred to me to use a different fruit haha! These sound awesome. I love the way this sounds! Absolutely love it!! So pretty and man who can resist this on a warm summer day!